For those who admire and appreciate Salt Lake City artist Trent Alvey and her history of extraordinary projects, the topics she explores are much of the thrill of the viewers’ experience. She is known for expressing her ideologies through unconventional form. “Painting is just one aspect of using one’s creativity, and creativity is essential to our survival,” Alvey says. Experimental with erudition of form and content, Alvey’s work consistently offers universal relevance infused with the power to create awareness. This power originates with Alvey’s genuine, thoughtful method of seeking inspiration. She thinks deeply and is perpetually engaged in a dialogue of philosophies, theories and concepts within herself, grounded in books of scientists, mathematicians and theorists. The articulation of form is secondary to Alvey’s investigative ideological progression. When she finds an idea particular motivating, it is an involved process. 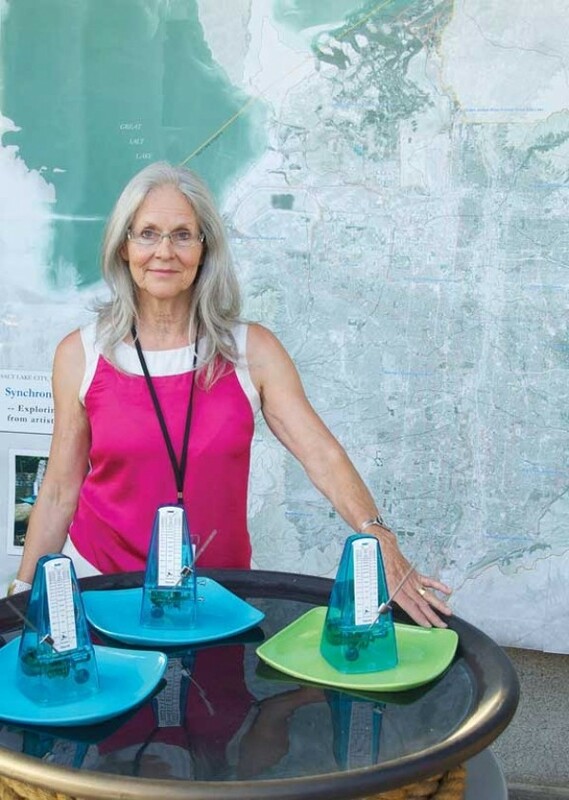 It includes many stages of evolution of ideas developing toward an ultimate realization that results in a complete, airtight piece—like her compelling and eye-opening installation currently being shown outside the Leonardo, “Synchronicity,” made possible by the Salt Lake Arts Council. The subject for “Synchronicity” is water and the potential for balance in nature given the imprint of human artificiality, causing what Alvey describes as “alteration.” The awareness of nonlinear systems is fundamental to the project. This quality is definitive of Earth’s natural ecosystems, such as flower pollination or precipitation. It is not predictable, and forms its own self-regulated patterns, according to Alvey. Channels of water and human consciousness are also nonlinear systems. They serve as a conceptual foundation for the project, and the duality of both systems is a metaphor of active, conscientious awareness of the potential hazards of alteration. Waterways and human consciousness both have a further quality understood as fractal geometry, which is found in nature as the structure of the particular imitates the whole. Creeks and streams have tributaries, branches, inlets and outlets with a microcosm equivalent to the macrocosm in form. Hypothetically, fractal geometry of human consciousness is the neurotransmission of thought by the neuron via chemicals. Fractal geometry contributes essential order to an otherwise chaotic system, and is vital to Earth’s self-regulating ecosystems. Linear systems, conversely, are predictable, logical and manufactured systems, with human artificiality being their single source. Consequently, artificial linear systems can create hazards when they overlap with Earth’s natural nonlinear water systems. Alvey commissioned a large photographic image of the Salt Lake Valley—created by expert cartographer Rick Tingey—featuring the waterways that enter the valley. As the inlets traverse the Wasatch Range and collect centrally, they are introduced to the artificiality of civilization. The map provides evidence of the disruption of creeks and streams by myriad displacements and manipulation due to the interference of linear systems that debilitate fractal geometry. This results in a chaotic state of the natural water system. Human imprint jeopardizes the harmony of ecological systems globally. “Synchronicity” is a theory of Alvey’s that postulates a human consciousness in harmony with nonlinear systems, without alteration. One intriguing and effective demonstration of synchronicity involves a large steel cauldron filled with water. On the surface are three floating disks, with a waterproof musical metronome paced on each. The rhythm of each metronome is set individually, resulting in a cacophony of noise. Slowly, with each beat of the metronome, the three individual sound patterns begin to coalesce in rhythm until, in a moment that seems magical, the three beat in perfectly synchronized unison. This is caused by the frequencies of the metronomes that travel through the air, and water causing them to synthesize. “I like to use physics demonstrations as a launching point for the conversation to begin. I often use scientific language or demonstrations to capture the attention,” Alvey says. She hopes an awareness gained through “Synchronicity” will inspire ideas in her audience of actively aware human consciousness functioning in harmony with nature in personal everyday living. The demonstration of synchronicity is an optimistic expression that harmony can be achieved among differing systems that coexist as one. This is not a didactic installation, but an inspiring one that encourages action on an individual and societal basis. A theoretical effort may be found in “crowd wisdom.” According to Alvey, this is a universal, collective intelligence, and this phenomenon may encourage awareness, progression and motivation focused on the reality of altered nature, thus engendering new ideas, innovative approaches and solutions. The journey of this exhibit has been expansive, and a labor of love by the impassioned Alvey, who says, “ ‘Synchronicity’ opens an infinite amount of questions.” Alvey is an exciting, experimental artist whose work is thoughtful and complex, generating engaging experiences of contemplation and awareness.